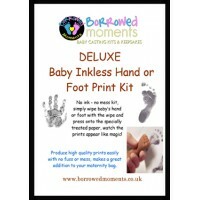 A brilliant & fascinating way to show off your hand and foot prints, this is a large 12” x 8” Framed Prints Kit with a Black, wooden frame, you will get one inkless wipe, 2 large sheets of specially treated paper and the frame, complete with all necessary fixings and instructions for you to create your own special keepsake, there is even a space for you to add name or date details; these are added easily by writing or printing on some paper or card and fixing to the back of the mount. The two outside spaces are approx. 6"x3" (152mm x 76mm); the middle, photo space is approx. 5" x 3" (127mm x 76mm) and the name space is approx. 0.5" (12mm).